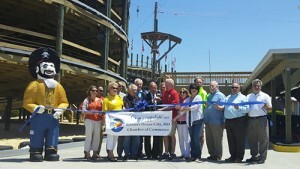 OCEAN CITY – Jolly Roger celebrated the opening of its latest addition of the Cyclone Cart Coaster in Speedworld last Friday with a ribbon cutting celebration. 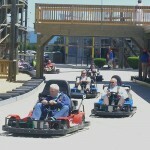 The coaster is over 1,500 feet long and five stories tall made of 78 pilings, 83,000 stainless steel bolts, and 22,320 square feet of lumber with 20 new go carts available to drive. The west tower essentially has four loops heading up reaching the top where spectacular views of the bay can be seen. The track then turns east toward the ocean where the carts descend down the east tower with another four loops. 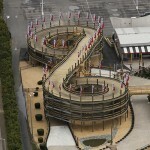 An aerial view of the newest addition to Jolly Roger’s Speedworld is pictured. Greater Ocean City Chamber of Commerce Executive Director Melanie Pursel recognized Jolly Roger is always adding the latest and greatest attractions to their parks, such as the most recent attractions of the zip line and Aqua Loop. The Cyclone is an outstanding attraction to be put forth for Ocean City’s visitors, Ocean City Tourism and Marketing Director Donna Abbott said. “The Jolly Roger crew is always coming up the latest and greatest, and this is certainly something that our visitors are going to love,” she said. Mayor Rick Meehan, along with many other city officials, took the opportunity to ride the Cyclone for the first time along with family and friends. Senator Jim Mathias, Ocean City Councilman Dennis Dare and Commissioner Chip Bertino are pictured trying out the new Cyclone last Friday. Another new attraction at Jolly Rogers on 30th Street this year is a roller coaster, the Wildcat that will be open in the next couple of weeks. Also continuing this year in July and August is Jolly Roger’s free circus that occurs every night, twice a night. This year the circus will be headlined by the Flying Wallendas. “We are looking forward to having them here and offering a free circus, keeping family entertainment valued, which we have done so long,” Langrall said.